The AYP website and support forums have seen 1.7 million unique visitors from 230 countries and territories, and 14 million page views (hits) since Google Analytics record-keeping started in July 2007. The following graph, data and map links cover AYP website and support forum traffic statistics since July 2007. Statistics for 2003-2006 are not included. For those who are interested in regional traffic details, below are Google maps and statistics showing AYP website traffic distribution for the world, zooming in on the most active countries and regions. Demographics from "AYP on YouTube"
Note: The geographical distribution of AYP on YouTube video views is similar to the Google stats above. Since Google does not cover age and gender demographics, the YouTube stats for this are included here. Wishing you the best on your path. Practice wisely, and enjoy! As a side note, AYP also reaches a lot of people who never come to the websites. The experience I've had with introducing AYP to people is that not more than 25% have visited the websites more than a few times, with maybe 10% visiting regularly. In my case, most that I am in contact with have learned the practices from the DM book. So AYP is far more reaching than these statistics give it credit for. It is good to know there is a lot of independent study and practice going on out there, far beyond what we can see here on the internet. That is how it should be. Ultimately, I hope this will lead to many more independent meditation groups, retreats, international translations, research, etc. Of course, anyone who visits the AYP website or forums even only once will be included in the "unique visitor" total. If they are only dropping in once or twice (pretty common, as you say), there will be less shown from them in the "page views" (hit) count. This would account for the average ratio of page views to visitors being what it is. Some make many more return visits to the website than others, and it all averages out to the stats we see here. The reason these traffic stats have been posted publicly is not to harp on the necessity for web activity. It is more in keeping with the philosophy of openness of information in AYP. In these times, more than at any time in the past, the transmission of spiritual knowledge is part of everyone's path. So it is good for all of us to know what is going on with AYP around the world. These stats can also be viewed as an indication of what is happening with yoga-related spiritual practices in general worldwide. The regional maps and stats are particularly revealing on this. They really show you where the action is going to be in the 21st century, and where more attention may be needed. These stats are to remind us that AYP is a toolbox with a global reach, and that it can be a significant help to many people in many cultures. With the evidence of steady growth, it can inspire us to do more to help increase the availability of spiritual practices to many more people around the world who may be inclined to take advantage. For those who can use the knowledge, we'd like to have it available in the most useful form possible. When we have done that, then it is up to each practitioner to take responsibility and move ahead through the process of human spiritual transformation as they are called to from within. The above website statistics have been updated as of March 31, 2009. The above website statistics have been updated as of June 30, 2009. Looking at Ireland I see there are 4,825 visits, which is pretty cool and represents just over 1 visit per head of population. What about the land of the cedars?! I didn't like to say anything... so I'm glad you spotted it first. I think there are a few million Irish... but it is still a good count on the web stats. Oh! thank you! the statistics are quite impressing! The above website statistics (first post in this topic) have been updated as of September 30, 2009. The above website statistics (first post in this topic) have been updated as of December 31, 2009. With it being year end, the most active countries/regions maps and statistics have been updated also. Excellent stats.! As you say, very revealing. It speaks volumes about the universality and secularity of the teachings.I am however puzzled that even though India has contributed to a lot of your teachings, the "visitors" from India are a lot less than what I would have expected. But I expect these figures to change dramatically. India is an interesting study. The AYP stats point to a few things. First, as you noticed, the land of yoga is yet to catch on to the AYP approach. Perhaps because thousands of traditional gurus are available to the broad population (over 1 billion) in India. At the same time, those who have been migrating to a modern industrial lifestyle (about 300 million?) may be rejecting the old traditions, and have not yet seen AYP as part of a new way of approaching spiritual development that is compatible with the modern lifestyle, and even compatible with (supplementing) the ancient spiritual traditions. What may not be obvious from the AYP stats is that traffic from India is accelerating. If you look at the 2.5 year country ranking, there is a significant gap in traffic between the UK and India. If you look at the country ranking in the 2009 stats (about 2/3 of the way down the PDF), you will see that in 2009 the gap between the UK and India traffic became almost nil. It is pretty clear that India is passing the UK in traffic, probably having more traffic than the UK in the second half of 2009. Let's face it, a country with 1 billion people will bring more traffic than a country with 60 million. It is only a matter of time. The next one for India to overtake in AYP traffic is the USA. That might take a while. I'm all for it. It is interesting to look at the distribution of AYP traffic in India. The Chennai/Bangalore area (where you are) is the most active AYP region, with the Mumbai/Pune area running second, and the Delhi/New Delhi area running third. So the big modern cities are where AYP is finding readership. It's not surprising, considering the progressive approach we are pursuing here, geared to unfolding spiritual progress within a modern lifestyle in a self-directed fashion. India is a sleeping giant in so many ways. It will be interesting to see how it plays out with AYP there. Your help in spreading the word is much appreciated. Not one sharing goes in vain. As you said in your other post, the potential is huge. All things in good time. Another point of interest might be to check (if possible) how many of the visitors from countries other than India are actually of Indian origin. I expect there would be many. While I don't have statistics on that, it has been a large number (maybe 10-20%) seen here in email (and in the forums) over the years from USA, Canada, Europe, Middle East and elsewhere. These are people from India living the modern lifestyle around the world, and may well represent the path of full-scope yoga in India in coming years. So, yes, good point. India reaches far beyond her borders these days. Some have said that the rich spiritual heritage of India is fading under the pressure of modern industrial society. I don't think this is true. It is transforming to meet the need of the times, as it always has. People everywhere have an inherent need to cultivate their infinite inner potential -- more now than ever. So adaptions and integrations of the ancient wisdom for more effective application are sure to continue in the modern age. AYP is but one example of this. Far from fading, I think there is a huge upsurge, worldwide,in (benign)spiritual activity. It is palpable in India, as I am sure it must be elsewhere, fundamentalism and fanaticism notwithstanding in some areas. Definitely, but not necessarily the way traditionalists would like. Nevertheless, change is happening on the deepest levels. "The Shine" is emerging in everyone, everywhere. 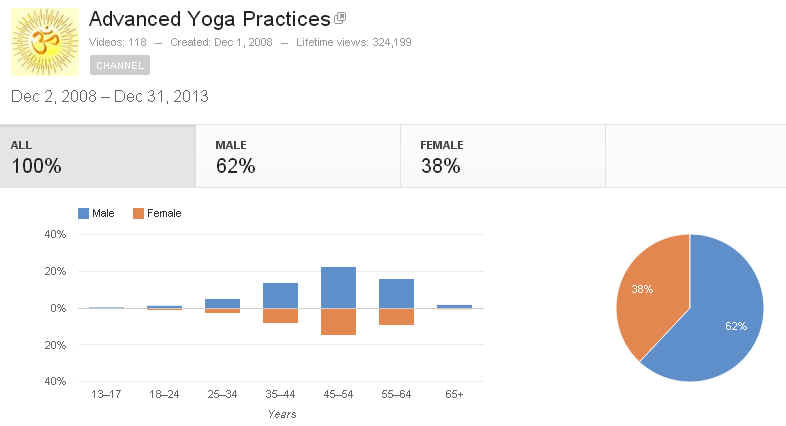 Because Google Analytics does not provide age and gender demographics, these have been added for 2009 from AYP on YouTube at the bottom of the above website statistics (first post in this topic). You might find it interesting. I did. The above website statistics (first post in this topic) have been updated as of March 31, 2010. The most active countries/regions maps and Youtube demographics are updated annually, so those will be updated at the end of the year. Wishing you all the best on your path! PS: World map and stat links are now provided for both July 2007 - March 2010 and 12 Months Ending March 2010, so more recent country/territory activity can be seen in relation to the whole. The Google website statistics and YouTube age/gender demographics (first post in this topic) have been updated as of June 30, 2010. The world maps with ranked country statistics have also been updated through June 2010, since 2007 and for the past 12 months. The most active individual country/region maps are updated annually, so those will be updated at the end of the year. The Google website statistics and YouTube age/gender demographics (first post in this topic) have been updated as of September 30, 2010. The world maps with ranked country statistics have also been updated through September 2010, since 2007 and for the past 12 months. The most active individual country/region maps are updated annually, so those will be updated at the end of the year. The AYP website and support forums have seen 317 thousand unique visitors from 212 countries and territories, and 5.7 million page views (hits) since Google record-keeping started in July 2007. The following graph and data links from Google cover AYP website and forum traffic statistics. The graphs show monthly data.